The artist of this set is from Tonala in the state of Jalisco (Mexico). He has won Mexico’s presidential award for his art. 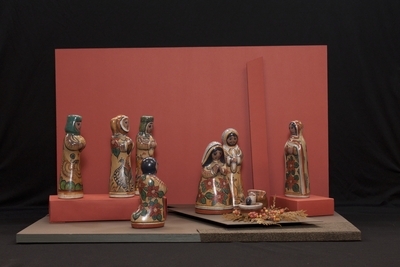 Esparza makes his nativity sets using pre-Columbian techniques inherited from his ancestors. The clay is dug from the hillsides near his town, and the dyes are all natural materials. The distinctive features of this set are the lively and varied design elements, mainly floral and animal figures interspersed with geometric ornaments. The ornamental figures are the real reason for this nativity set. Christmas rose, peacock or rabbit: they all proclaim, in so many voices, the wonders of life. Ceramic figures sculpted by José Tomás Esparza León in the 1990s in Tonalá, Jalisco, Mexico. The figures depict the nativity of Jesus. Exhibition label originally written by Fr. Johann G. Roten, S.M. for exhibit held at Roesch Library, University of Dayton.